Since the 8th century the feast of the conversion of St. Paul has been set apart by the Church to return thanks to almighty God for His act of grace in bringing the future apostle to the Faith. 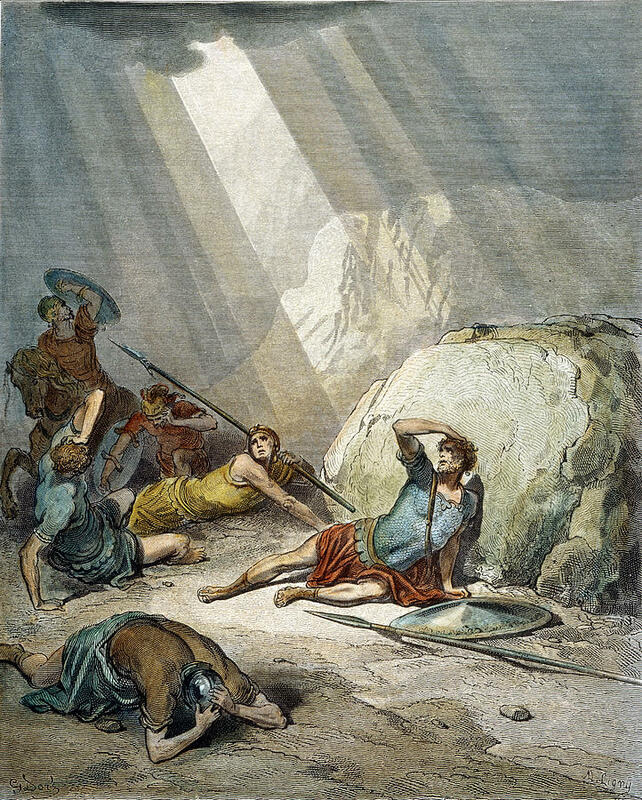 After the miracle of Christ’s Resurrection no other wonder in the history of the early Church is a stronger proof of the divine origin of Christianity than the marvelous conversion of St. Paul. Just as there was a commemoration of St. Paul on the Feast of St. Peter’s Chair at Rome last week, there is a commemoration today of St. Peter at the Collect, Secret and Postcommunion. Lesson from the Acts of the Apostles. In those days, Saul, as yet breathing out threatenings and slaughter against the disciples of the Lord, went to the high priest, and asked of him letters to Damascus, to the synagogues; that if he found any men and women of this way, he might bring them bound to Jerusalem. And as he went on his journey, it came to pass that he drew nigh to Damascus: and suddenly a light from heaven shined round about him. And falling on the ground he heard a voice saying to him, Saul, Saul, why persecutest thou Me? Who said, Who art Thou, Lord? And He said, I am Jesus of Nazareth, Whom thou persecutest. It is hard for thee to kick against the goad. And he trembling and astonished, said, Lord, what wilt Thou have me to do? And the Lord said to him, Arise, and go into the city, and there it shall be told thee what thou must do. Now the men who went in company with him stood amazed, hearing indeed a voice, but seeing no man. And Saul arose from the ground, and when his eyes were opened, he saw nothing. But they leading him by the hand, brought him to Damascus. And he was there three days without sight; and he did neither eat nor drink. Now there was a certain disciple at Damascus, named Ananias and the Lord said to him in a vision, Ananias. And he said, Behold I am here, Lord. And the Lord said to him, Arise and go into the street that is called Strait, and seek in the house of Judas one named Saul of Tarsus; for behold he prayeth. (And he saw a man, named Ananias, coming in, and putting his hands upon him, that he might recover his sight.) But Ananias answered, Lord, I have heard by many of this man, how much evil he hath done to thy saints in Jerusalem: and here he hath authority from the chief priests to bind all that invoke Thy name. And the Lord said to him, Go thy way; for this man is to Me a vessel of election, to carry My name before the gentiles, and kings, and the children of Israel. For I will show him how great things he must suffer for My name’s sake. And Ananias went his way, and entered into the house, and laying his hands upon him he said, Brother Saul, the Lord Jesus hath sent me, He that appeared to thee in the way as thou camest, that thou mayest receive thy sight, and be filled with the Holy Ghost. And immediately there fell from his eyes as it were scales, and he received his sight; and rising up he was baptized. And when he had taken meat, he was strengthened. And he was with the disciples that were at Damascus for some days. And immediately he preached Jesus in the synagogues, that He !s the Son of God. And all that heard him were astonished, and said, Is not this he who persecuted in Jerusalem those who called upon this name: and came hither for that intent, that he might carry them bound to the chief priest? But Saul increased much more in strength, and confounded the Jews who dwelt in Damascus, affirming that this is the Christ. He Who worked in Peter for the apostleship, worked also in me among the Gentiles: and they recognized the grace of God that was given to me. V. The grace of God in me has not been fruitless; but His grace always remains in me. Alleluia, alleluia. V. A great saint is Paul, a vessel of election, he is indeed worthy to be glorified, for he was made worthy to sit upon one of the twelve thrones. Alleluia. At that time, Peter said to Jesus, Behold we have left all and followed You; what then shall we have? And Jesus said to them, Amen I say to you that you who have followed Me, in the regeneration when the Son of Man shall sit on the throne of His glory, shall also sit on twelve thrones, judging the twelve tribes of Israel. And everyone who has left house, or brothers, or sisters, or father, or mother, or wife, or children, or lands, for My name’s sake, shall receive a hundredfold, and shall possess life everlasting. To me, Your friends, O God, are made exceedingly honorable; their principality is exceedingly strengthened. O Lord, make holy the offerings of Your people, through the prayer of Paul, Your Apostle, that those things which You have established as pleasing to You may be more pleasing through his patronal intercession. Through Jesus Christ, thy Son our Lord, Who liveth and reigneth with thee, in the unity of the Holy Ghost, ever one God, world without end. R. Amen. We beseech You, Lord, may the prayer of the blessed Apostle Peter recommend the petitions and offerings of Your Church, so that what we celebrate in his honor may obtain forgiveness for us. Through Jesus Christ, thy Son our Lord, Who liveth and reigneth with thee, in the unity of the Holy Ghost, ever one God, world without end. R. Amen. Amen I say to you, that you who have left all things, and followed Me, shall receive a hundredfold, and shall possess life everlasting. Made holy by the sacrament of salvation, we beseech You, O Lord, that the prayers of him under whose patronal care You have granted us to be ruled may never fail us. Through Jesus Christ, thy Son our Lord, Who liveth and reigneth with thee, in the unity of the Holy Ghost, ever one God, world without end. R. Amen. O Lord, may the gift we offer bring us joy, that as we praise Your wondrous work in Your Apostle Peter, so through him may we share Your generous forgiveness. Through Jesus Christ, thy Son our Lord, Who liveth and reigneth with thee, in the unity of the Holy Ghost, ever one God, world without end. R. Amen.